It’s never good to pick favorites, but when it comes to flycatchers, the Great Crested Flycatcher (Myiarchus Crinitus) is mine, hands down. These beautiful and boisterous flycatchers are more often heard than seen. 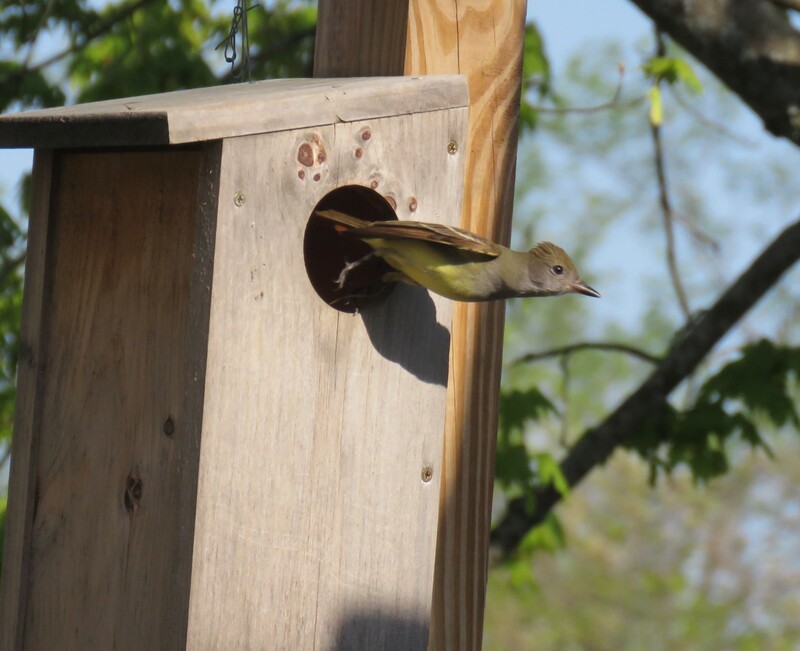 Their favorite summer habitat is high up in the leafy canopy of tall forest trees where they nest within deep tree cavities across much of the eastern half of the United States. 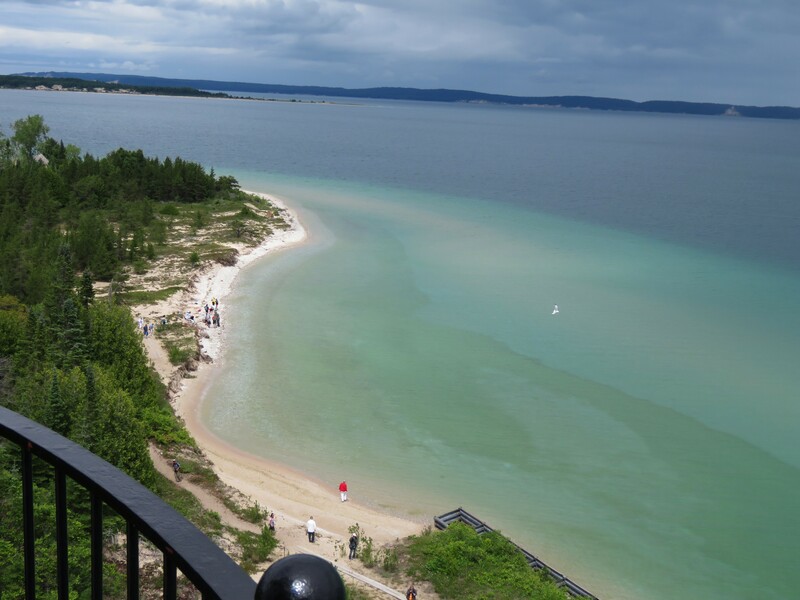 I first became keenly aware of the flycatchers last summer when I became completely frustrated by them on South Manitou Island: island overlooking the often stormy Manitou Passage that is part of Sleeping Bear Dunes National Lakeshore. Whenever I heard their unmistakable territorial call echoing through the woodlands, I stared into the tops of the tall trees in hopes of discovering the source. I failed every time. The melody remained a mystery until the near completion of my 30-day stay on that wilderness island as the National Park Service lighthouse keeper. That’s when a backpacker noticed me craning my neck upwards as the song came from the tree tops. 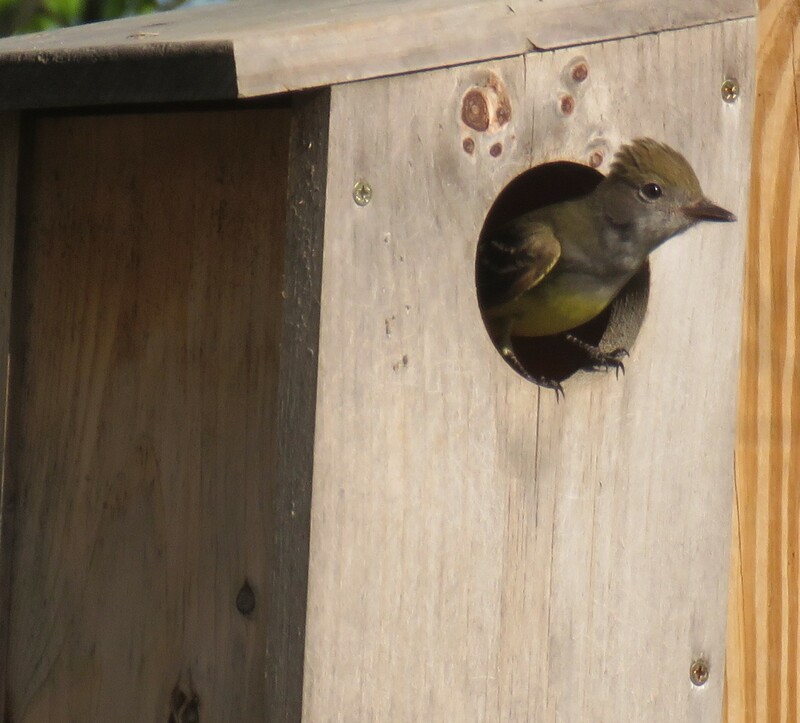 She casually commented that she was happy to discover Great Crested Flycatchers near her campsite overlooking a wooded bluff on the island’s south shore. It was that moment that brought “Bird ID Happiness,” a feeling best understood by birders. I now had a name for the bird that had been just a mysterious, yellowish-brown flash of wings that carried a beautiful song. But try as I might, I was never able to capture a single photo of those island-life loving flycatchers of South Manitou. They stayed in the tree tops and I stayed on the ground, except for when I climbed the 117 steps to reach the catwalk of the 1871 lighthouse. Photo failure changed last month, not on some island wildland, but right in my Brandon Township yard back at my home base in Oakland County. I had just settled down with coffee and my notepad in my “outside office,” perhaps more accurately described as a wooden arbor with flowers, vines, a metal desk, and an old chair, when suddenly I heard that music again. And this time the flycatcher was not way up in the tree tops, but much to my pleasure was perched on the roof of an abandoned squirrel nesting box almost next to me. It’s beak was full of twigs. How does a flycatcher sing with a mouthful of twigs? It can’t, that’s when I noted the male flycatcher perched on a tree limb that shaded the arbor, singing his heart away. Over the next two weeks, that pair of Great Crested Flycatchers and I became aware of each others’ behavior and routines as we coexisted rather peacefully in our shared corner. At times, the flycatchers even seemed to pose for my camera as they went about nest building and hunting for nearby insects on the ground. Their nest material gathering activity seemed to peak at around 8:30 a.m., fall off around 10:30 a.m., and then restart in the later part of the afternoon. On almost each trip back from their foraging forays they would first land on a branch of a nearby maple tree and look about, as if checking for scene safety. From there it was few wing flaps to the upper beam of the arbor to look all about again with a bit of head bobbing, and then it was time to fly directly to the roof of the birdhouse. Within a few seconds, the flycatcher would take wing, fly a few feet past the opening and then zip right inside. A few minutes would pass before they would come out in lightning-fast speed, an act I only captured a few times on camera. 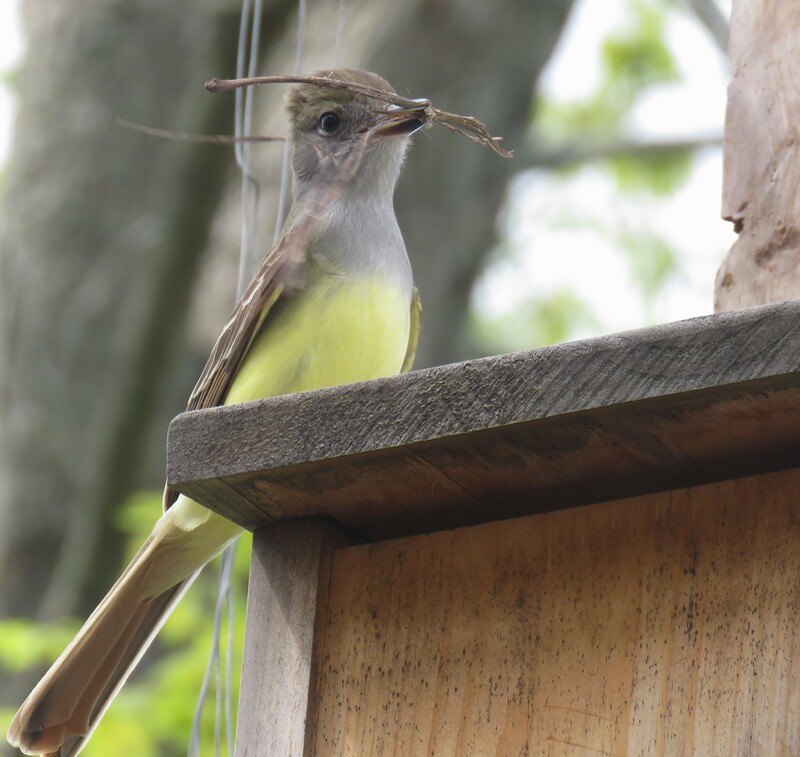 When bird behavior and facts written about birds disagree, always go with the behavior, for Great Crested Flycatcher, like many other bird species are both opportunist and adaptable to what nature and humankind offers. Cornell also confirmed that some nests are only two feet off the ground and they often take over artificial nesting opportunities, including a variety of human made structures that offer cavities, such as my squirrel box, leading me to believe that my birds were well heeled, upscale, and followed the advice of the ornithology lab. I noticed their nesting material was a mix of dried grasses, small twigs and bits of bark. 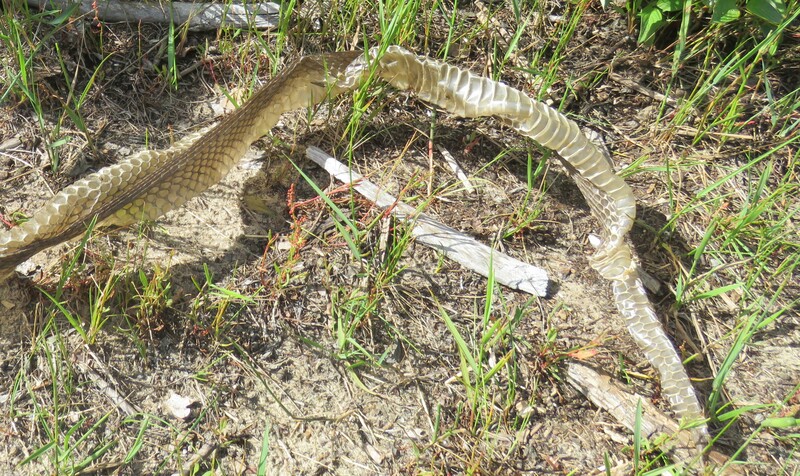 Having read they often add snake skin to the nest, I placed the shed from a garter snake (I save such things) on the ground within a bird’s eye view of their nest box. The next morning it was gone, but I never saw them take it. 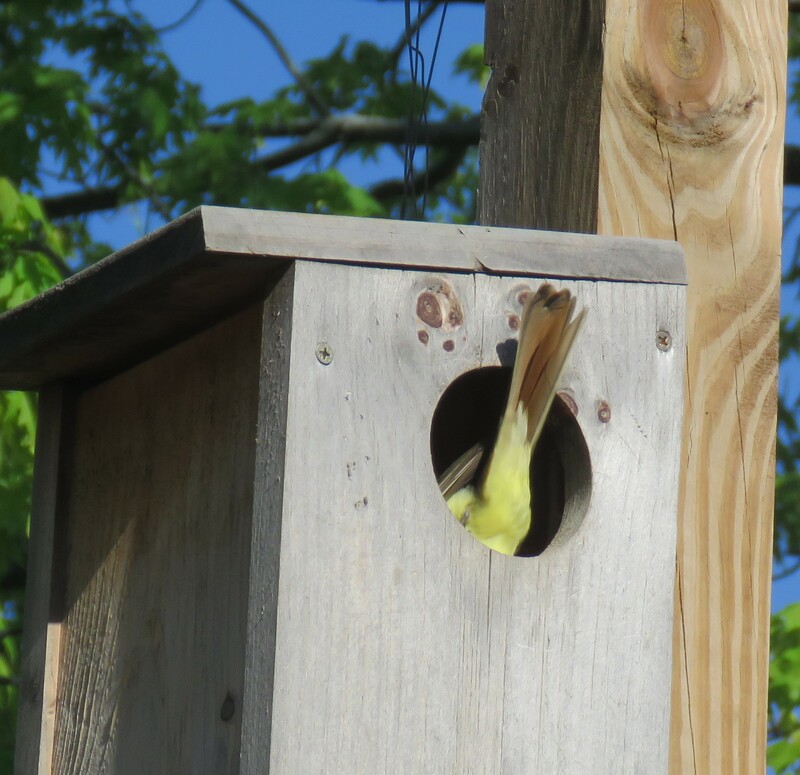 It won’t be until they migrate south in the early days of autumn that I will open the nesting box to see if they accepted my offering or it blew away in the night winds. Feeding seemed to be opportunist from my chair vantage point and their hunting techniques varied, but in each case it appeared the motion of a insect was the starting gun. The flycatchers sometimes hopped about my wildlife-friendly “lawn” pausing for a few seconds, and then their heads would go down and forward as if to grab a meal. At times I would watch them perch on the barren stalks of raspberry bushes or a dead branch watching for movement, and then they would flutter down for a meaty morsel, most likely a small bug, fly, butterfly, grasshopper, cricket or caterpillar. I am back on South Manitou Island now and will be for the reminder of June. I still hear the Great Crested Flycatchers on the island, but they seem to stay in the leafy tree tops out of my view. Perhaps tomorrow I’ll be lucky and be able to peer down into the tree canopy from the catwalk of the lighthouse and finally see one of the island’s colorful and large flycatchers that are more often heard then seen. Even if I don’t, I’ll look forward to seeing the pair that made their home in my Oakland County yard and perhaps I’ll witness them feeding hungry young mouths. Stay vigilant this summer and perhaps you too will catch a glimpse of this raucous flycatcher with a raised crest somewhere on the Wilder Side of Oakland County, or lands far beyond. ← Dinosauria at the Detroit Zoo! So glad you captured the cry of the bird. Now, what bird is it that stays around all year and cries, “Breaker, breaker”? Always. You and Sharon Greene are my favorite writers.